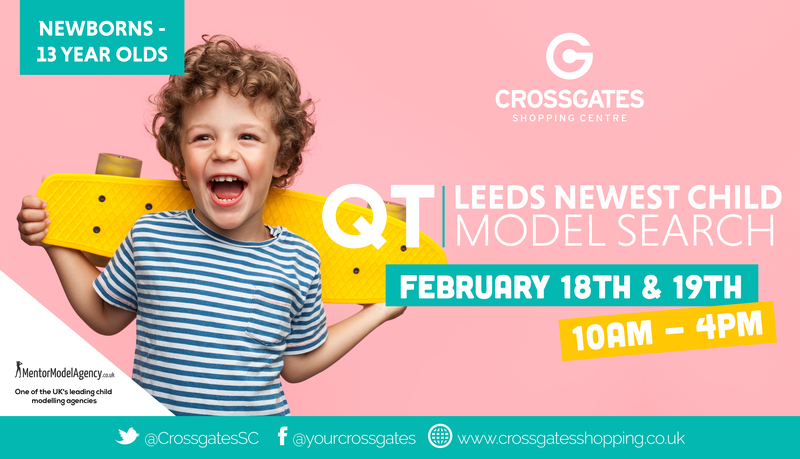 Has your little one got what it takes to be Leeds’ next top model? We are introducing a brand new modelling competition for newborns to 13 year olds. QT is a baby, toddler, child and teenage model search which could result in the winner of each category (as well as several runners up) being represented by one of the UK’s leading child model agencies, Mentor Model Agency. The winners will be given a portfolio photo shoot with digital images provided, which will be used on the model agency’s website for at least 12 months. They will also have opportunities to work with some of Mentor Model Agency’s clients including some of the UK’s leading brands- Boden, Mamas & Papas, Next, Silver Cross, Tomy, John Lewis, Very, F&F, Pretty Little Thing, Adidas, Footlocker, JD Sports and Franklin & Marshall. Runners up will be invited for a free photo shoot at Mentor Model’s studio and if you’ve got what it takes you could also be in with the chance of being represented by the organisation. Entry is free. All you have to do is turn up between 10am and 4pm, on either the 18th and 19th of February to get your child’s picture taken by a professional photographer. The event will take place in centre square (outside Wilko).